Perfectly golden and crisp on the outside, with a light and fluffy interior. Top with a pat of butter and warm maple syrup, and dig into these mouthwatering breakfast treats. Quick and Easy Waffles are great to throw together for a speedy and decadent weekend breakfast, and are sure to be a crowd pleaser. With all of the wintery weather outside, I love heating up our house with a nice warm breakfast. These Quick and Easy Waffles are the perfect morning treat. They only require a few basic ingredients, that I’m guessing you already have in your kitchen. These waffles are great to make with your kids, or can easily be whipped up before the little ones, or your husband, even get out of bed. 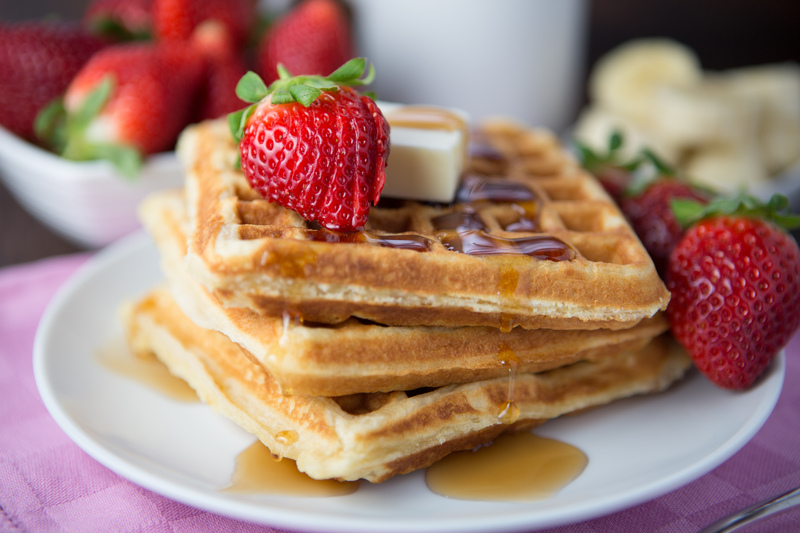 There is just something so wonderful about coming down to the aromas of rich, buttery, freshly baked waffles. Another thing I love about enjoying these waffles on the weekend, is that they are FANTASTIC when reheated. Plus, they also freeze well, too! Just pop a few in the toaster, slather on the butter and syrup, and you can dig into that weekend goodness all week long. 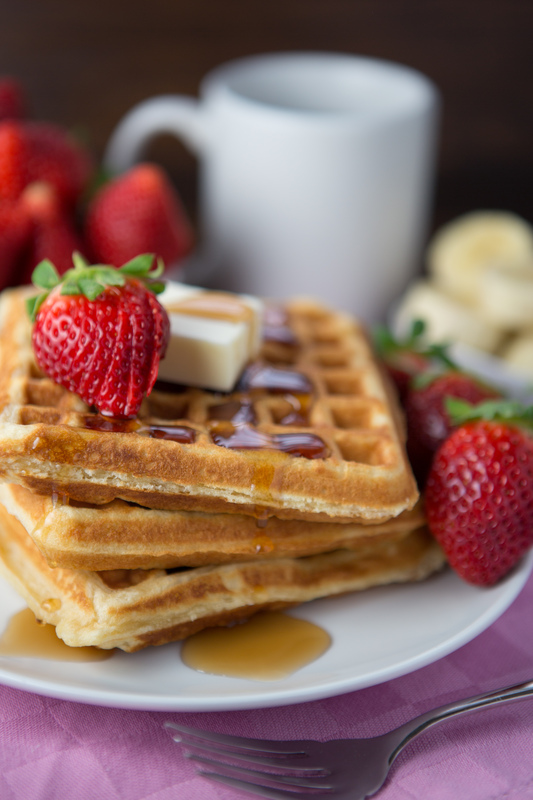 For a little variation, try topping these waffles with fresh fruit, such as strawberries, blueberries or bananas. If you’re craving something a bit more decadent, add chocolate chips and whipped cream. However you dress them up, one thing is for sure, these Quick and Easy Waffles will be a family favorite in no time! Slightly crisp and fluffy waffles that come together in a flash. In a large bowl, whisk together the flour, sugar, baking powder and salt. Set aside. In a medium bowl, slightly beat eggs, then whisk in the milk and vanilla. Make a well in the center of the flour mixture, add the wet ingredients, and gently whisk together. Don't over mix. Then carefully fold in the butter with a rubber spatula until just combined, batter should be slightly lumpy. Using a preheated waffle iron that is lightly greased with cooking spray, pour batter onto iron, spread slightly if needed, and gently close lid. (Use about 1/4 cup batter for an iron that makes smaller waffles, or about 1 cup batter for an iron that makes larger waffles). Bake according to waffle maker directions. When waffles are done, carefully remove from griddle with a fork. Repeat with remaining batter and serve warm with syrup. To keep waffles warm while cooking, place waffles on a wire rack on a baking sheet in a 200 degree oven until ready to serve. 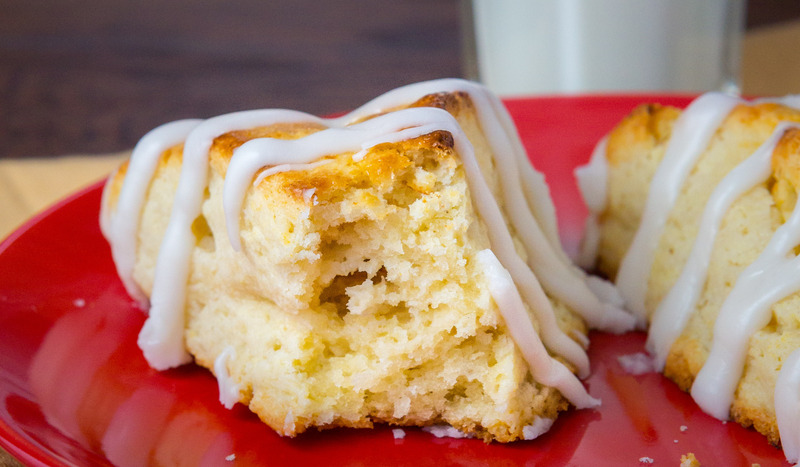 A perfectly crisp exterior, with a light and fluffy inside, drizzled with a mouthwatering icing. 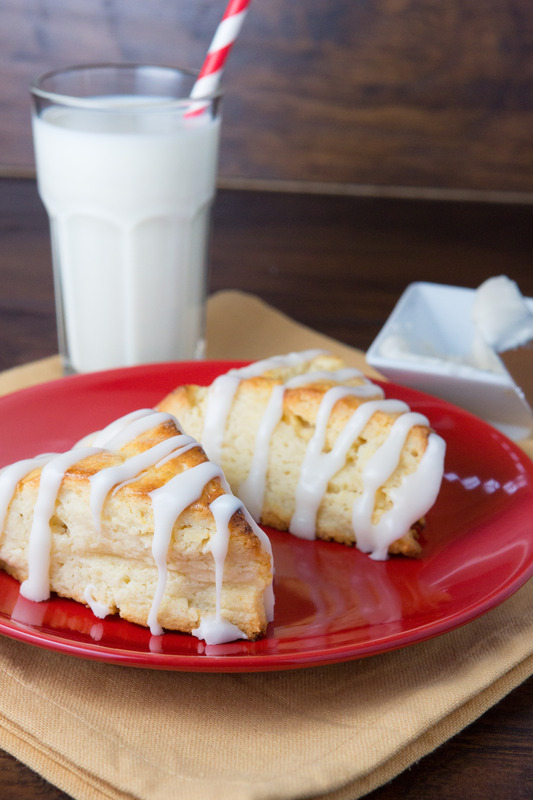 Simple Glazed Scones are delicate and delectable. Easy to make and incredibly divine, these little treats are sure to be a hit. I can’t believe Thanksgiving is right around the corner! Four days to be exact. I think there is something so wonderful about this time of year. I just love all of the amazing food, great smells and wonderful experiences that are always shared around the dinner table. I love coming together with my family, and remembering all of the blessings that we have, and all that we are thankful for. The last two weeks have just flown by! Wow! The boys and I have been having tons of fun at story time, playing with friends, venturing out in the snow, running errands, and of course having a blast cooking and eating. Andrew has been traveling a bunch for work, which is probably one of the reasons I’ve been a bit on the tired side 😉 All in all, the last two weeks have been incredibly fun and rewarding, and just a tiny bit exhausting. I’m very thankful for a nice LOOOONG weekend coming up! Here are a few pictures from our adventures. Scones! There’s just something so sophisticated and decadent about these little goodies. Firm and crisp like a cookie, with all of the fluffy goodness of a piece of cake. Ohhhh my! 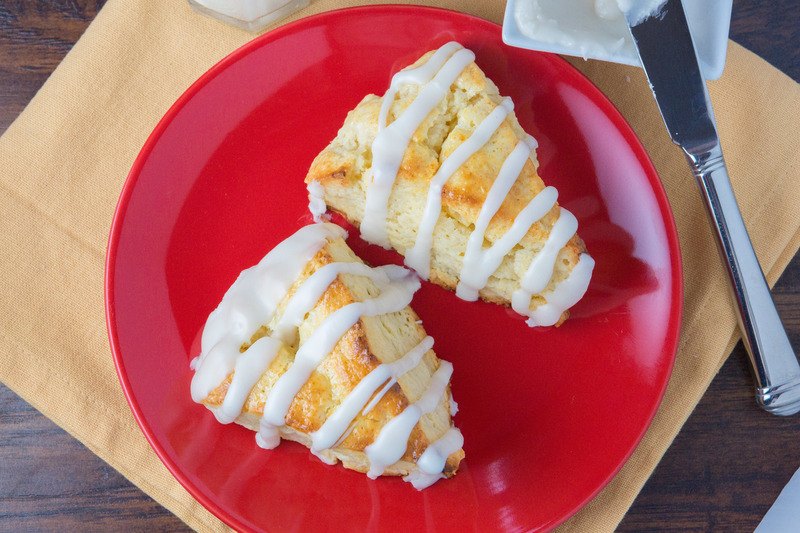 If you’re hosting company this Thanksgiving and need an impressive breakfast element, or just want something scrumptious to wow your family with, these Simple Glazed Scones are just the thing! They are perfect for breakfast with bacon and eggs, great for an uplifting afternoon snack, or even make for a wonderful dessert after a fun-filled day. I love them with a huge glass of ice cold milk, morning, noon, or night. My inspiration for these scones came from a recipe I found on MyRecipes for the Best-Ever Scones. I made a few minor changes to the directions, but for the most part, this is such a dynamite recipe as it is! One change it did make was the need to refreeze the dough once it has been sliced. This helps to keep the scones cold right before they go into the oven, and helps to ensure their shape while baking. I also added a sweet glaze to top them off. I think this little touch not only makes them look fantastic, it also gives them that true bakery taste and texture. Grab your bowl, a few ingredients, and get ready to bake. Pop them in the oven, and in a few minutes your house will be filled with the rich smell of SCONES! 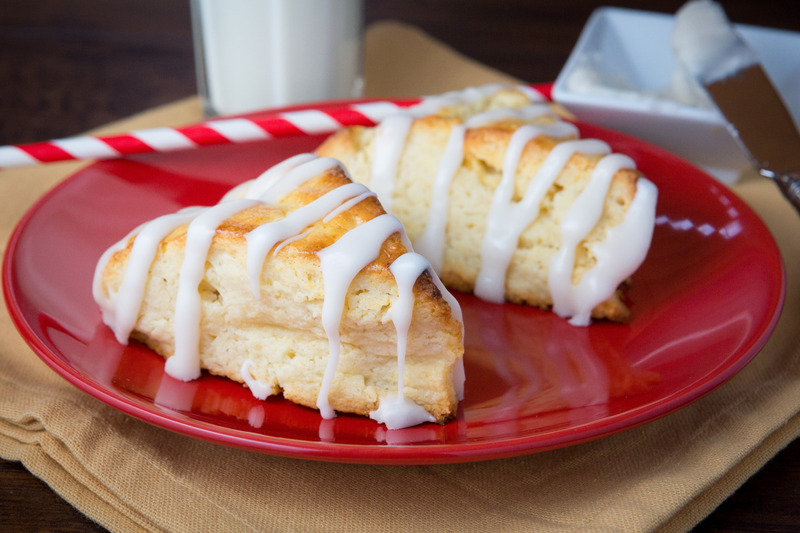 Simple Glazed Scones are sure to be a Thanksgiving morning (or anytime) delight. In a large bowl, add flour, sugar, baking powder and salt and whisk together. Cut in butter with a pastry cutter (or back of fork), until mixture resembles small pea sized crumbs. Place bowl in freezer for 5 minutes. Remove bowl from freezer, and add 3/4 cup plus 2 tablespoons cream. Stir immediately with a metal spoon until mixture is just moistened. While still in bowl, shape dough into a ball, dough will be crumbly. Place ball onto a piece of wax paper, and press and shape into a 7-inch flat, round disk. Using wax paper, wrap up disk and place in freezer for 5 minutes. Remove from freezer and cut into 8 even triangular wedges. Place triangles 2 inches apart on a baking sheet lined with parchment paper or Silpat baking sheet. Brush tops of scones with remaining 2 tablespoons cream, until moistened. Bake for 10-12 minutes or until golden brown. Cool for 5 minutes on baking sheet, then move to a wire rack to cool completely. To make the glaze, in a small bowl, add powdered sugar, water, vanilla and salt, and whisk together until smooth. (Glaze will look like a thick paste). 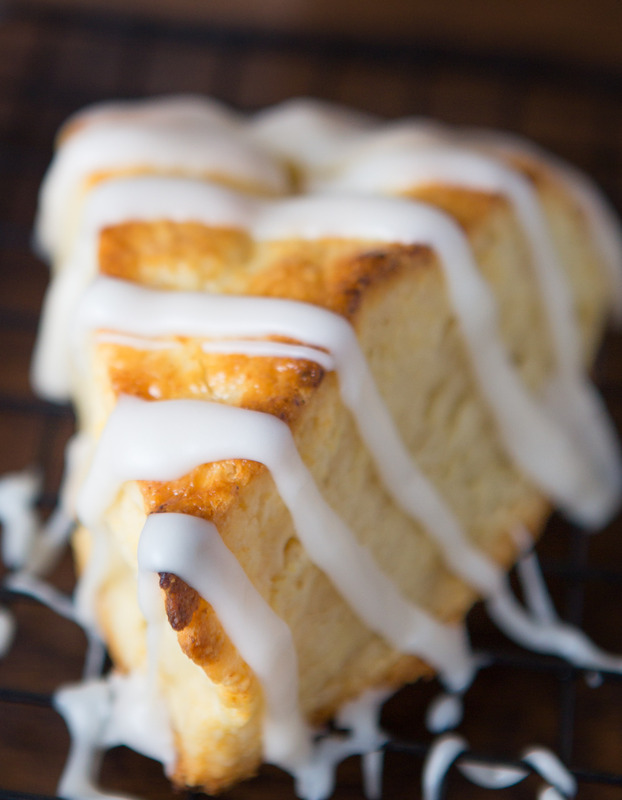 Once scones are cool, drizzle glaze lightly over the top of each scone in a zig zig pattern. Also glaze to harden for at least 5 minutes. If glaze becomes too hard to drizzle, place bowl in microwave for about 10 seconds to soften. If you’re looking for another great breakfast bread or snack recipe, check out my Pumpkin Bread with Cream Cheese Frosting. Sweet, wholesome, blueberry pancakes topped with a chunky blueberry sauce. Packed with flavor and mouthwatering goodness, these Oat Flour Blueberry Pancakes are such a great guiltless treat! It has been quite a busy, but amazing two weeks as a family of FIVE! We are so in love with Charlie! He is seriously the best and easiest baby ever. William and James are fascinated with him and are the greatest big brothers! William has been a super helper lately, and James is our little helper in training. We are so thankful for all of our blessings. I don’t think Andrew or I could ever have imagined a better experience of having our third baby. I’m so happy to say that we are thriving and doing better than we ever imagined with a new born and two other little ones. We even had a date night in on Friday night and made our own sushi to celebrate Charlie turning two weeks old, and me getting a more than positive report from my doctor at my two week post baby check up! YUM!!! Friday’s sushi night was such a hit, we even decided to do it again last night as an early Father’s Day celebration. It’s amazing how much better I got at perfecting my sushi rolling technique the second night. Sushi making was a huge success and a lot of fun, and I will definitely be posting about it soon! Happy Father’s Day to my Dad and Father-in-law! We love you so much! Happy Father’s Day to my best friend, amazing husband, and the most incredible Daddy to our wonderful boys! You are totally awesome! Thank you for working so hard for our family, and for all of your unconditional love and support. (And thanks for changing ALL of the diapers in the last two weeks and doing so much around here while I healed!) You are the BEST! We love you SO much! If you’re looking for the perfect way to wake up Dad or anyone you love one morning, consider making these Oat Flour Blueberry Pancakes, and starting the day with a heaping plate of blueberry pancake goodness. In a large mixing bowl, stir together the oat flour, baking powder, salt and cinnamon, and set aside. In a medium bowl, add the egg whites, milk, yogurt, applesauce, agave, oil, lemon juice and vanilla extract and whisk together. Make a well in the center of the dry ingredients, and add the wet ingredients to the dry ingredients and whisk together until just combined. Fold in blueberries. Allow batter to sit out for about 20-30 minutes until thickened. While batter is sitting, combine blueberries, applesauce, water and lemon juice in a medium sauce pan and stir. Heat over medium heat until just bubbling, then allow sauce to simmer for about 30 minutes until thick. Keep warm. Heat a large grill pan or griddle over medium heat, and lightly coat with cooking spray or oil. After batter has been sitting, stir again before cooking. When pan is hot, ladle about 1/4 cup (or just a little less) of batter for each pancake. Cook on one side for about 3-4 minutes or until little bubbles appear. Flip over and cook on that side for another 2-3 minutes or until golden brown. Serve pancakes with warm blueberry sauce. 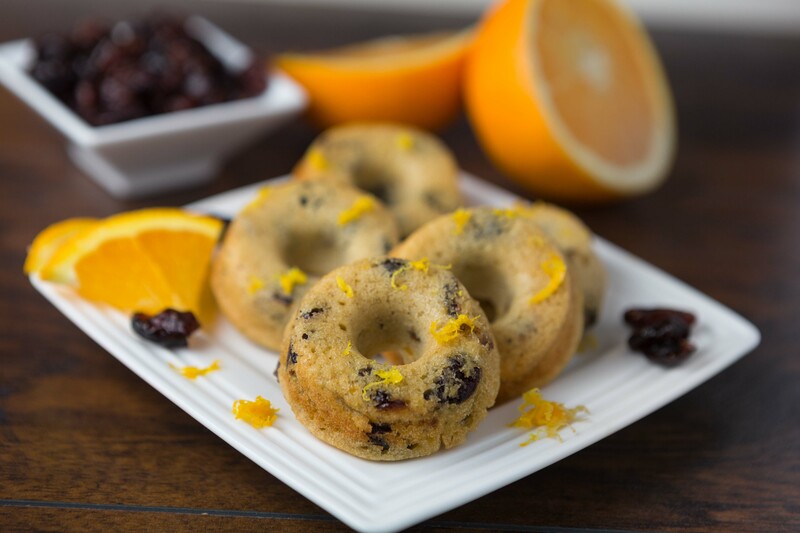 Light, sweet, mini donuts with fresh orange zest and plump, juicy cranberries, baked into an irresistible little ring. These Cranberry Orange Mini Donuts are a wonderful treat for breakfast, a snack, or a tasty dessert. Happy Sunday! It was another fun, and busy weekend around here. Andrew and I had a nice little night out on Friday just the two of us, thanks to his parents who came to babysit. I will confess that this time, our little date night was actually a “let’s run errands just the two of us” night. I mean, there are so many things to get done before the baby comes and not much time. We did have a lot of fun together, and accomplished quite a bit. Although, I did promise someone that our next date night will definitely be something much more relaxing and romantic. When I finally wrapped up this weekend’s overly ambitious list of “cook all the things!”, we decided to take full advantage of this chilly, but beautiful spring day. After nap time, we headed outside for a little family walk, and then snapped a few belly pictures, and pictures with the boys. Sunshine, walks, cooking, time with family, and mini donuts, what a wonderful little weekend! 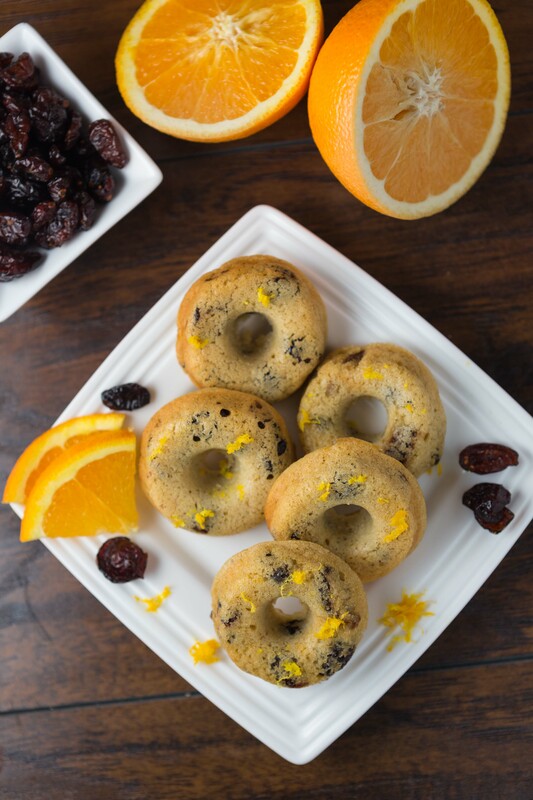 These Cranberry Orange Mini Donuts are a sweet, healthy little treat that the whole family will enjoy all week long! In a large bowl, whisk the oat flour, salt, baking powder and baking soda together, and set aside. In a medium bowl, stir together the milk and lemon juice, and let sit for 5 minutes, then stir again. Add to the milk mixture: orange juice, egg whites, applesauce, yogurt, oil, agave, and orange zest and whisk until smooth. Add the wet ingredients to the dry ingredients and whisk together until combined. Then fold in the cranberries. Allow batter to sit for about 10 minutes, then stir again. Spray a mini donut pan or mini muffin pan with non-stick cooking spray. Spoon batter into each tin about 3/4 of the way full. Bake for 14 minutes or until a toothpick inserted comes out clean. Allow donuts to cool in pan for 5 minutes, then move to a wire rack to cool. Store donuts in an airtight container for up to 3 days on the counter, or 5 days in the refrigerator. 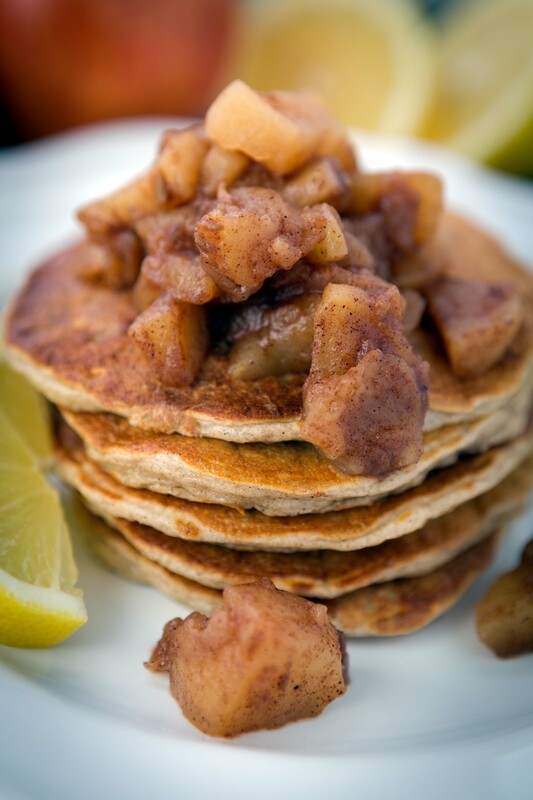 Soft, fluffy, oatmeal pancakes, topped with a mountain of sweetened apples, cinnamon and spices. 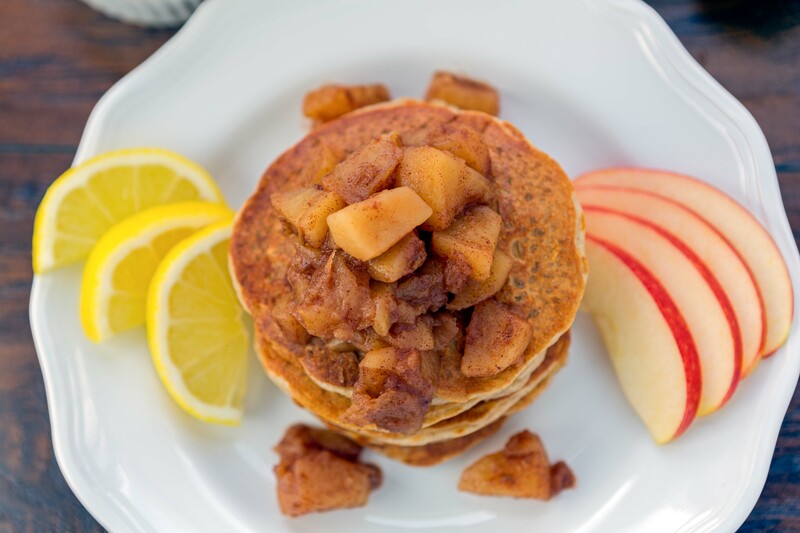 No Butter, No Flour, Oatmeal Pancakes with Warm Apple Compote are the perfect way to start your morning. Heart-healthy and fabulous, this is one breakfast that’s worth waking up for! Who doesn’t love cutting into a huge stack of thick, warm pancakes on the weekends? I know I sure do! The texture, the taste, the comfort. All rolled up into a cute little pancake. Pile them high, pour on the syrup, top with a little pat of butter, and all is right with the world. Until that sinking feeling in your stomach reminds you that just maybe you should have gone a little lighter on the syrup, or should have only opted for a shorter stack of pancakes. You know how it is, when you look back and regret indulging in a such a tasty morning breakfast. Well, here’s one pancake recipe that you can feel good about piling high! Grab your plate and stack them up! These No Butter, No Flour, Oatmeal Pancakes with Warm Apple Compote will give you all you need to start your weekend, or your weekday, off on the right foot! They are filled with everything good that your body needs to fuel your morning. The other night, Andrew and I were talking about our old stomping ground, Atlanta, Georgia. During our conversation, one of our favorite breakfast spots, The Flying Biscuit Cafe, popped into our heads. We sure have a lot of fond memories of that place! I remember going there for dinner one night while I was pregnant with William, and I ordered their amazing Organic Oatmeal Pancakes. Yum! There was also the time that we took my parents there when they were visiting. We had to wait outside for a table for over an hour! (The place is just that good!) As we were waiting, at least we were able to enjoy the lovely weather (that’s one thing that Atlanta has over Michigan for sure!). Great conversation, a beautiful morning, and all of the friendly people passing by. However, we will never forget the one man that was walking by, and decided to loudly comment on my dad’s burnt-orange colored sweater vest. From all the way across the street, he looked at my dad, and shouted, “That’s FABOO!”, and kept on walking. After the man walked away, the four of us were just about doubled over laughing. How funny?!!! Now, whenever we think of The Flying Biscuit, or my dad’s orange vest, we can’t help but think, “It’s FABOO!”. With a little inspiration from our friends down south, here it is! 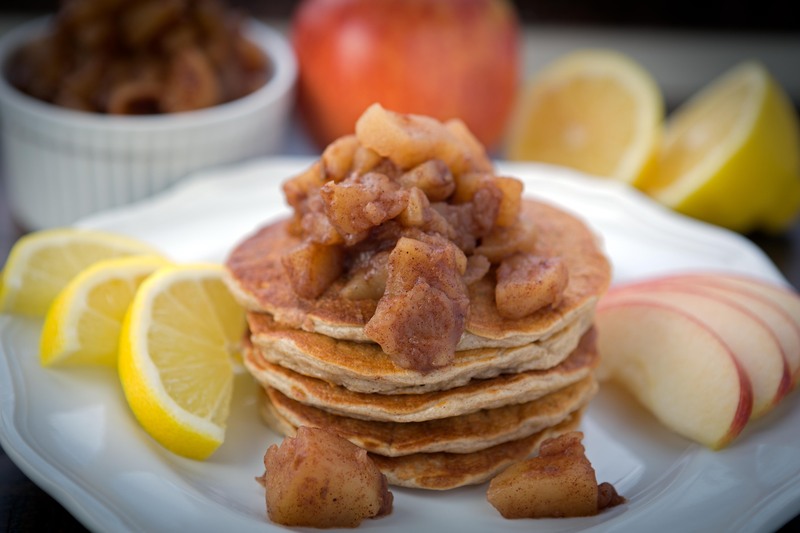 My totally “faboo” recipe for No Butter, No Flour, Oatmeal Pancakes with Warm Apple Compote. In a medium, microwave safe bowl, stir together the oats and milk. Microwave for 2 to 3 minutes, until oats are slightly softened. Set aside to cool. In a large mixing bowl, add egg whites and whisk. Then add the yogurt, lemon juice, oil, agave, and vanilla and stir together. In a small mixing bowl, add oat flour, baking powder, cinnamon, baking soda, and salt, and stir together. Add the oatmeal mixture to the wet ingredients and whisk together. Then add the dry ingredients to the oat mixture and stir together using a rubber spatula, until just combined. Allow batter to sit for about 30 minutes to thicken. While batter is sitting, you can make the compote: In a small sauce pan, combine apples, dates, water, vanilla, cinnamon, nutmeg, and salt. Turn heat to medium, and stir together. Allow mixture to come to a small boil, then turn heat to medium-low. Continue to simmer, stirring often, for about 30 minutes more, until apples are very soft, and the liquid has reduced greatly and looks thick and syrupy. Turn off heat and stir in 1 teaspoon lemon juice, and keep warm. Lightly coat a non-stick griddle pan or frying pan with cooking spray, and pre-heat over a medium-low burner. Gently give batter one last stir after it has been sitting. Once griddle is hot, ladle a little less than a 1/4 cup (about 3 tablespoons) of batter for each pancake, onto pan and cook pancakes on one side until small bubbles start to appear, about 3-4 minutes. Gently flip pancakes over and cook until golden brown, about 2-3 more minutes. Serve warm and top with apple compote. 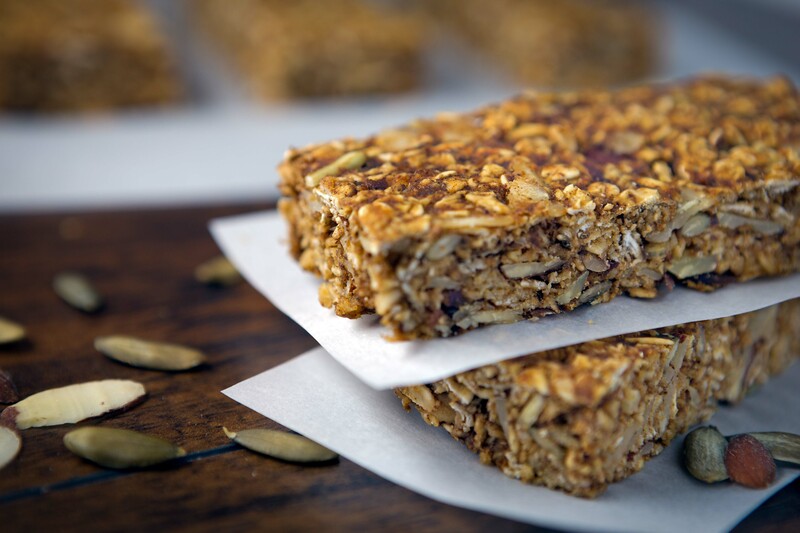 Soft, chewy, Healthy Pumpkin Granola Bars. Bursting with real pumpkin, oatmeal, and a blend of spices. Almonds and pumpkin seeds give them a little extra crunch that is sure to delight any pallet. Happy Sunday! This week we’re changing things up a bit at Elizabeth’s Home, and here we are, posting on a new day. I hope you have been having a wonderful and relaxing weekend just like we’ve been having. Sometimes we love to be busy and in the “go, go, go” mode, but other times it’s so nice to not have any big plans. This was definitely a “lay low” weekend for us, and gosh was it needed! We did however, have a wonderful lunch with my parents yesterday, at their house. We live a little less than 2 miles from them, and what a blessing that is. We love having them over to our house, and we love going over there. It’s always fun to have a change of scenery and for the boys to play with some new toys. I totally appreciate it when my parents offer to have us over for a meal. It is such a nice little chance of pace, and a well-needed break sometimes. I guess that’s part of being a parent, spoiling your kids, even after they are grown. 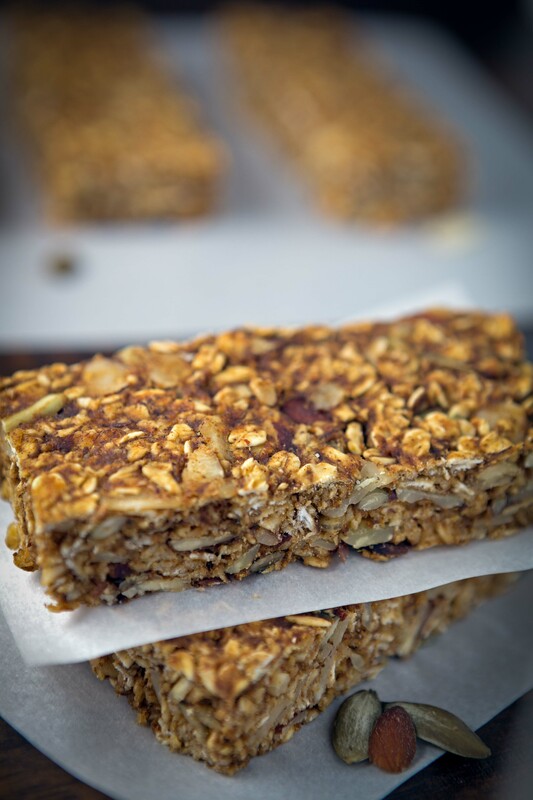 Yesterday at lunch we were talking about these healthy pumpkin granola bars, that William and I created earlier this week. Not only did they receive rave reviews in this household, but my parents were bragging about them as well! The best part about them, besides how amazing they taste, is how healthy they are. You don’t have to think twice about reaching for seconds, or gasp, even thirds, of these Healthy Pumpkin Granola Bars. These bars will leave you filled up, but not weighed down. They are great in the morning, as a snack, or even as a slightly sweet end to the perfect meal. I love them with a big glass of milk! In a medium mixing bowl, stir together the oats, almonds, pumpkin seeds, cinnamon, nutmeg, ginger, cloves, baking soda, and salt. Set aside. In a larger bowl, whisk the pumpkin puree, applesauce, maple syrup and vanilla, until combined. Add the dry ingredients into the pumpkin mixture, and stir together using a rubber spatula. Continue mixing until the oats are well coated. Pour granola mixture into prepared pan, and using a rubber spatula, spread granola out evenly, and press down firmly into pan. Bake for 20-25 minutes. Allow to cool for 5 minutes in pan. Then, using the excess parchment paper, gently lift bars from pan, and place on a wire rack to cool completely. Once cool, move bars to cutting board, and with a sharp knife, slice into 8 rectangles, or 16 squares. Store bars in an airtight container, separate layers with parchment paper to prevent sticking. Light, moist and fluffy mini-blueberry muffins that are packed with flavor, and skimp on the calories. Cinnamon, nutmeg, and lemon zest help to carryout the big flavor in these little guys. 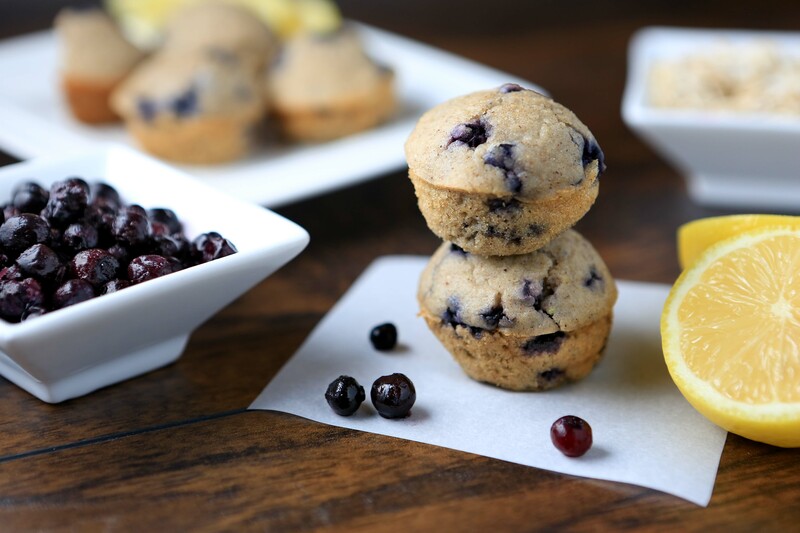 Guiltless Blueberry Mini Muffins are perfect for breakfast, dessert, snacks or anytime. What more could you ask for in a little muffin. Except maybe for them to also be gluten free, low in sugar, low fat, and maybe even sort of healthy? Well your search is over! Seriously, these little muffins are loaded with spices and everything good for you! One of my main goals when creating this recipe was the health factor, and the other was of course the taste. When we tested the first version of this recipe, we liked it a lot, but thought something was missing. In other words, they were “almost there”. After a few additions, and four different batches later, we have a winner! For this recipe, I kicked up the cinnamon, added a tad more nutmeg, and threw in some lemon zest. I really like how these flavors compliment the oat flour, and work together with the blueberries to bring out their sweetness. 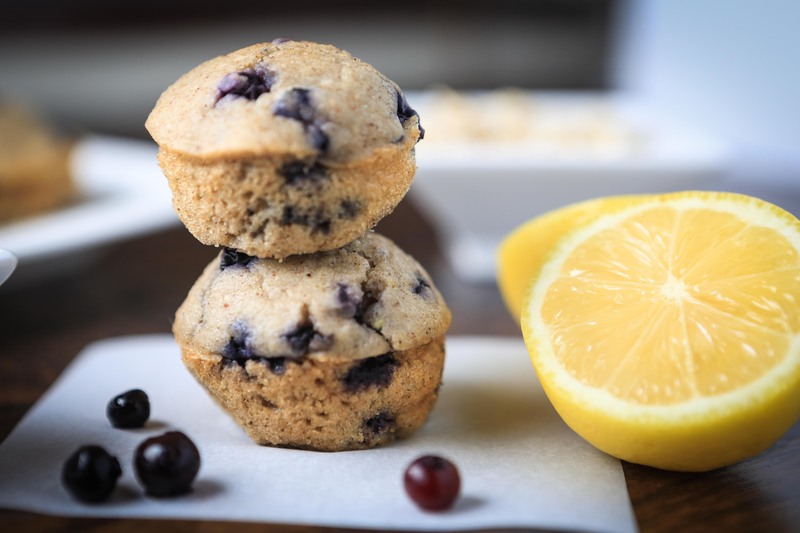 The Greek yogurt helps to keep these muffins moist, and adds an extra dose of protein. I have a feeling we can all use a little extra protein with these cold temperatures lately! This chilliness is not just a Michigan thing, either. Andrew and I have been thinking about our poor friends in Atlanta these past few days as they’re experiencing all sorts of problems due to the snow and freezing temps. This winter seems like it has a mind of its own. When the boys and I got into the car yesterday morning at 9:30, the temperature was -4 degrees! Brrrrrr! That is just downright cold, if you ask me. Those are the kind of temperatures that pretty much make me want to stay inside all day and keep warm. Although, there’s something to be said for bundling up, heading out and braving the cold, and then coming home to our warm house. So that’s just what we did yesterday. We ran to the grocery store, the library for story time, and then headed straight home for lunch to thaw out. After lunch, while James was napping, William and I decided that the best thing to do when it’s freezing outside, is to bake something warm and yummy inside. I love cooking with my kids! Even though sometimes it means taking longer, more messes, etc, etc. I think it’s so cute that they love to cook with me! William and I made a double batch of these delightful minis, and had quite a nice time just the two of us. 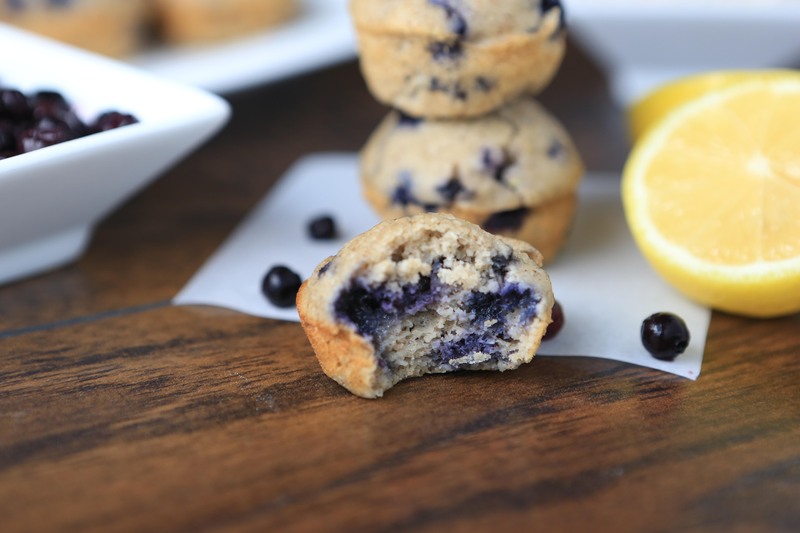 Next time you’re snowed in, or staying in because it’s too cold to go out, or just because, be sure to try these Guiltless Blueberry Mini Muffins. In a large mixing bowl, add the flour, baking powder, baking soda, salt, allspice, cinnamon, and nutmeg, and mix together. Set aside. Slightly beat egg whites in a medium bowl. Then add in milk, yogurt, oil, applesauce, agave, vanilla, and lemon zest and whisk together until combined. Make a well in the center of the oat flour mixture, and gradually whisk in the wet ingredients, until just combined. Coat a mini-muffin tin with cooking spray. Spoon batter into pan, filling each cup about 3/4 full. Bake for 8 to 10 minutes, until lightly browned and toothpick inserted comes out with just a few crumbs attached. Allow muffins to cool in pan for 10 minutes. Gently remove from tin and let cool on wire rack. Store in an air-tight container. Pancakes. Pancakes. Pancakes. Pan CAKES. Moist, doughy, deliciousness covered in syrup. What could be better than waking up on a Saturday morning to the smell of fresh, homemade pancakes from scratch? Nothing! Unless you are my husband and got to sleep in for two hours while the boys and I were hard at work perfecting these classic pancakes. William and I wore our matching aprons and James played in the pack ‘n play. James offered his advice every now and then with his adorable waves and laughs. William has become such a huge help in the kitchen and loves “dumping” in the ingredients. (He even has his own miniature whisk and spatula!) We whipped up this batter in no time and had a blast doing it. 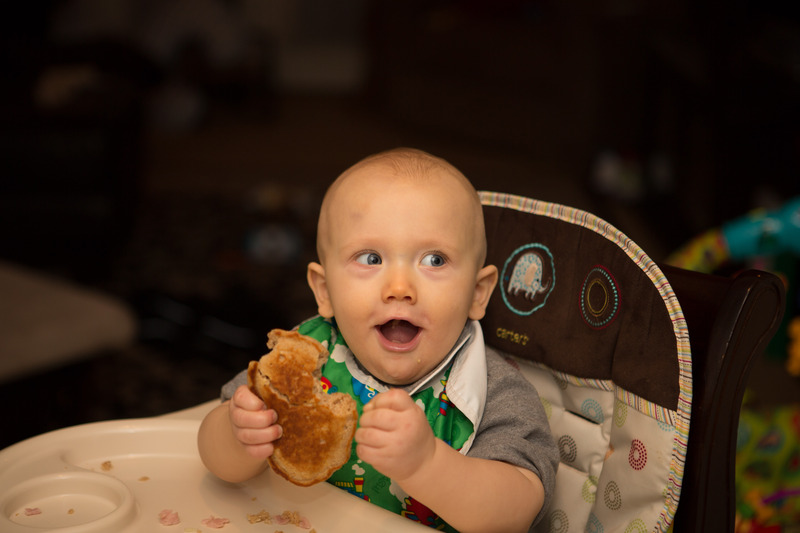 I even let William add chocolate chips to his pancakes, and he was ecstatic that he could have chocolate for breakfast. The boys and I enjoyed more than our share of pancakes, but all of that cooking sure made us hungry! 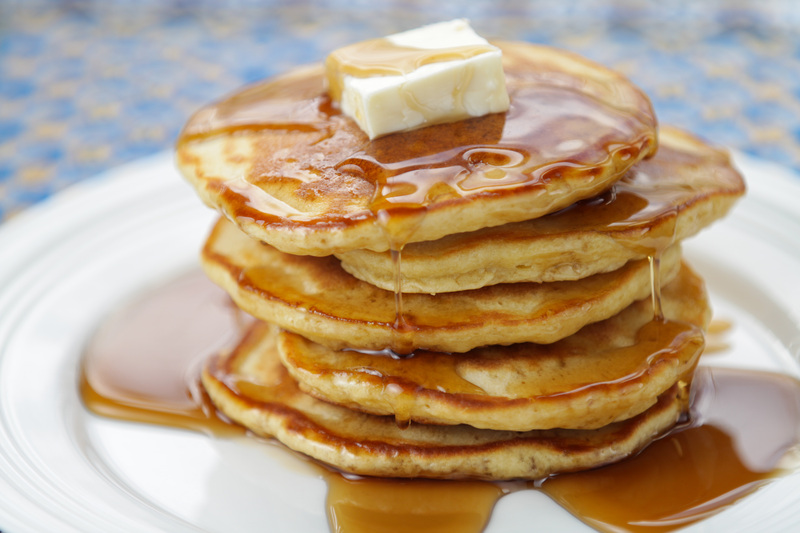 This is our favorite quick and easy, go-to recipe for pancakes that I love! These pancakes are delicious the next day, and even freeze well, too! Thick and fluffy pancakes that are perfect for Saturday morning or anytime. In a large mixing bowl, add flour, baking powder, salt and sugar, and whisk together. Set aside. In a separate bowl, whisk eggs, milk and vanilla together. Stir in melted butter.